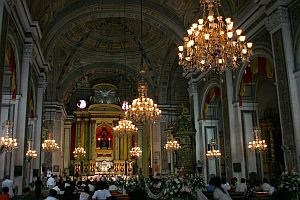 Sharing Tutubi's old pictures from his old "baul" of the Manila's old churches (and not so old ones). Note that most of these structures should be preserved for heritage values besides being lasting monuments of Filipino's faith. 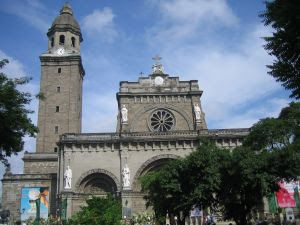 Description: San Agustin Church, Intramuros -Oldest Catholic Church in the Philippines and the only Church in Intramuros’ original seven that survived the the February 1945 Battle of Manila. Showcase of Earthquake Baroque architecture with interiors painted with trompe-l'oeil. Spanish conquistadors, Miguel López de Legazpi, Juan de Salcedo and Martín de Goiti are buried in a tomb, underneath the church while the nearby crypt (inside San Agustin Museum) lies the remains of Juan Luna. Description: Augustinian built on the second half of the 18th century, Muslim-Baroque architecture. 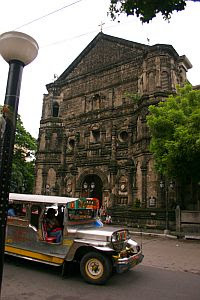 The church served as stone fortress of the British against the Spaniards in Intramuros. How to get there: From Quezon City, Espana or Quiapo, hail a jeepney bound for Mabini and get off in front of the church. 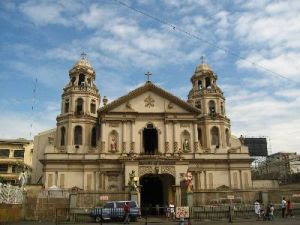 Description: the church of Ermita which was founded in 1591 as a small chapel with Nuestra Señora de Guia as patroness. Directions by car/taxi from Makati, head towards Osmena Highway then Quirino Avenue. Turn left on Paz Guanzon St all the way to UN Avenue. After crossing Taft Avenue, turn left M.H. del Pilar St and look for the church on your left. Description: One of two churches in Manila devoted to the Santo Nino and therefore celebrates fiesta on the third Sunday of January. Description: Paco Cemetery, where St. Pancratius Chapel, was the place where the remains of Jose Rizal was buried in an unmarked grave and also the grave of the three martyred priests- Gomez, Burgos and Zamora, were buried. How to get there: the place is a mere five minute walk from LRT UN Avenue station, walk towards Padre Faura St (the side opposite Philippine General Hospital)you'll see the old walls of the chapel on San Marcelino St. Description: Franciscan, 1586. Home of the annual January Black Nazarene procession on January 9. How to get there: Quiapo Church is walking distance from LRT Carriedo Station All jeepneys with Quiapo signboard will take you to the church (after some walking). Franciscan Missionaries founded in 1578, present church built in 1720. How to get there: From LRT Pedro Gil Station (Herran). Hail a Sta. Ana-bound jeep and get off right in front of the church. Description: the only all-steel church in Asia. Has links to Gustave Eiffel of France. Description: Dominican Friars 1596, badly damaged during World War II, only the octagonal bell tower and some foundations remain of the original church structure. How to get there: From Taft Avenue, hail a Divisoria-bound jeepney. Get off in front of the church. Description: Society of Jesus (Jesuits) 1608. Dominican after the Jesuits’ expulsion. Original structure damaged during the Battle of Manila in 1945. Rebuilt in 1957. How to get there: The Church is walking distance from LRT Carriedo Station. Commute from Taft Avenue, hail a jeepney bound for Sta. Cruz and alight in front of the church. 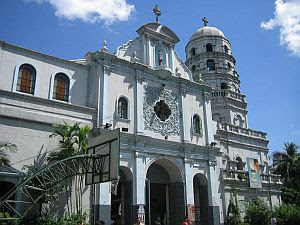 The original Church of St. Anthony of Padua was built in Paco in 1619; relocated in Sampaloc in 1783. 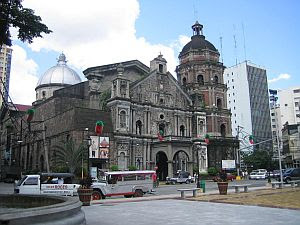 Note: the other UNESCO Heritage Sites in the Philippines lumped together with San Agustin Church as Baroque Churches include Miagao Church in Iloilo, Paoay Church in Ilocos Norte, and Sta. Maria Church in Ilocos Sur. learned a lot from the churches you've featured in this post. wow, churches! they're like camera magnet to me. i've always been fascinated with them and when i got into photography, the fascination grew. really appreciate this post as a lot of the churches you featured are really familar to me since i grew up in manila and heard Masses in those same worship places. this is what i miss here in the US: big old churches shown on this post. the church bells too. You don't own a picture of Quiapo Church??? I can hardly believe this! Glad I visited them all... so I hope I am excused if I visit other places during Holy Week! Tell us what exciting events will happen in your home town and I might spend my whole Holy Week in Paete next year! carlotta, ows? you don't know how to commute to binondo? my bosses here know i take good friday off every year, and i make a point to visit as many churches as i can around a 10-mile radius. Beautiful churches. Thanks for sharing these. I might not come there in Holy week but I will definitely visit some of these churches in the future. Just in time for the Holy Week! Visita Iglesias is done usually on Holy Thursday. I remember doing one in Metro Manila. Naga City also has enough number of churches in a smaller area. some are saying 7 churches to be visit, some are saying 14, what is the truth behind that? Hey tutubi, you frequent Quiapo pala? I am interested to see the place nga although i don't know whom to go with. i dont think i am that adventurous to do it alone though. My friends are certainly not the type to be interested in the REAL manila. but thanks for this site i am now becoming more than willing to just do it. wish me luck!